Thank you for sharing this wonderfully informative post with us Indira. What a beautiful temple! The Hindu temple is a condensed image of the cosmos constructed as a mandala known as the vastu purusa mandala. The Purusa refers to the Universal essence which is without form or substance; Vastu refers to the site or the bodily existence or substance of Purusa. At the center of the mandala is the sanctum where the divine image is placed; this divine image, made in stone or wood or brick is the material consecrated representation of the Universal essence. The building of the Hindu temple is not left to the imagination or the creativity of the shilpi (architect) or the artisans; it is strictly guided by the sacred texts called the shilpa shastras. 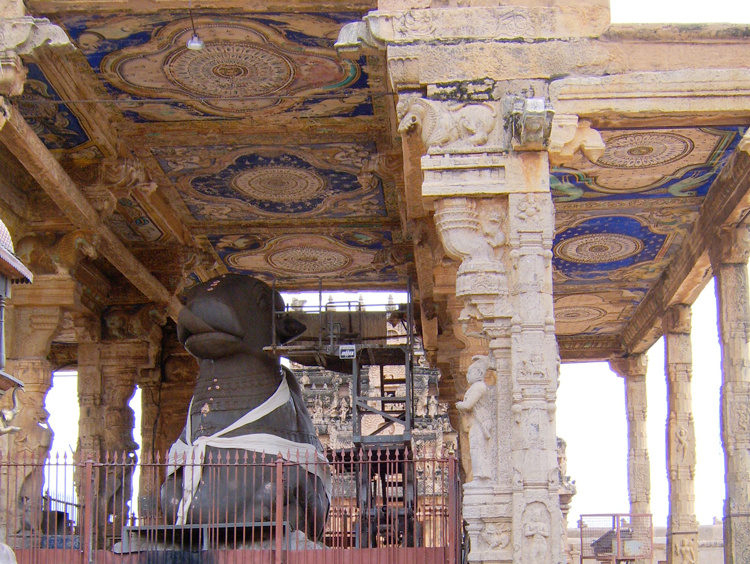 The construction of a temple, from start to finish, is considered a ritual activity. Architecturally, the Hindu temple resembles a mountain and represents the link between heaven and earth. 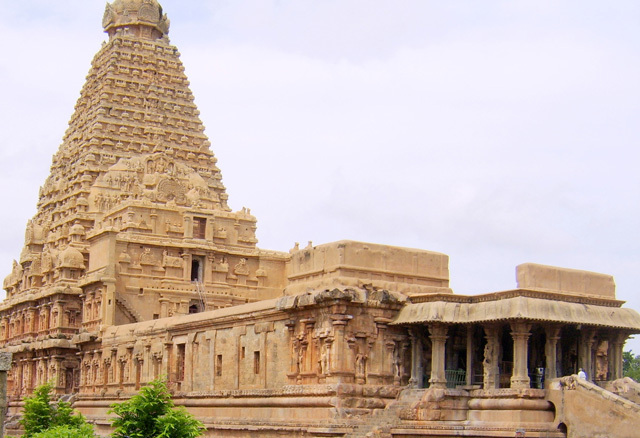 The triangular tower like structure is called the shikara or gopuram and is located directly over the inner sanctum. Like a mountain, the exterior of the temple is lush with intricate carved representation of various plant, animal, human and divine forms, while the inner sanctum, where the main deity is placed, with enclosed walls is dark. The interior of the temple directs our attention to the center, the garbha or the womb, that which is the source of the Universe. The inner sanctum is called the garbagraha or the womb chamber. The journey of the worshipper to the temple is considered a pilgrimage in itself. The pilgrim starts the journey by circumambulating the temple first, the exterior form of the Universe, then walks to the interior sanctum, the center of the Universe. Approaching the sanctum, the worshipper performs another circumambulatory passage around the sanctum before "seeing" the deity at the center. The deity in the inner sanctum is the primary consecrated image of the temple, though a temple may have several secondary gods housed in various shrines placed in appropriate quadrants of the mandala. A Hindu goes to the temple to receive 'darshana', a Sanskrit word meaning "seeing". It is a dialectical act, seeing the divine and being seen by the divine. According to Hindu theology, God is present in the image and is real. By standing in front of the image and looking into its eyes, the worshipper seeks the divine blessings. The images shown here are of the Brihadeeshwara Temple, a designated UNESCO World Heritage site that turned 1000 years old last year. It is located on the banks of river Cauvery in the town of Tanjore, Tamilnadu, India. 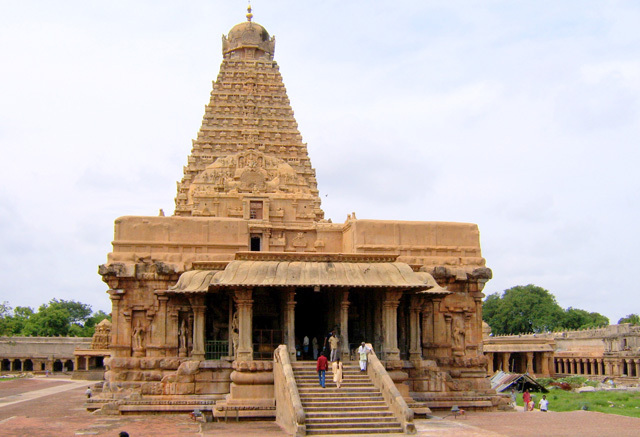 It was built by one of the emperors of the Chola dynasty, Rajaraja Chola. As befitting the richest empire of its time, it was built on a large scale and came to be called the Big Temple. 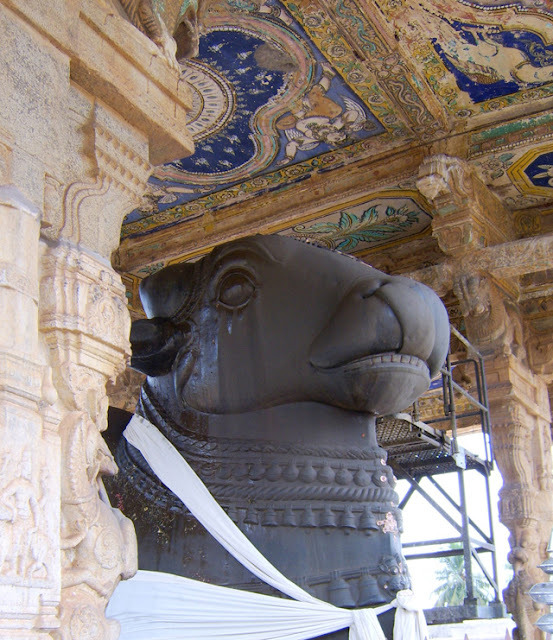 Dedicated to the Hindu god Shiva, its most striking features are the 200 ft tall tower (gopuram) that rises from the base sanctum, the massive granite cupola (vimana) at the top of the tower and majestic stone image of Nandi, the sacred bull. It is one of the best examples of the south Indian style temple architecture. Indira's beautiful journals, artwork and jewelry can be found in her shop on Etsy. How absolutely beautiful this temple is! I would love to go there. Everything you wrote about the temple, its construction, your explanation of the symbolism and meaning, and the temple's use was so interesting. I loved what you said regarding 'darshana', about seeing and being seen by the divine. How wonderful! Thank you. I'm really happy that Indira did this post for us. I had a conversation with her earlier this year where she explained to me the astrological associations with the temples and I thought it was just fascinating. So many wonderful places to visit...so much to learn about in this world, isn't there?